» Home » 2014 » May » 30 » how much “you” does it take to DIY? how much “you” does it take to DIY? DIY means do-it-yourself, but in reality most DIY projects are done with a little bit of help. That help may come in the form of a great “how-to” video or online resource , a chat with a colleague who has done something similar or a consult with a person who has some of the professional skills that you require. That said, the vision, the inspiration, the connection to your students – those things are central to the success of a project involving the development of a learning resource (regardless of the media used)- and they can only come from you. Beyond that, the decisions you make about how much of “you” to invest in your DIY project will be dictated by your budget, your time and your interests and skills related to media production. One thing is certain, you will have questions, many questions, along the way! This is where you get to dream big about your students and their learning. 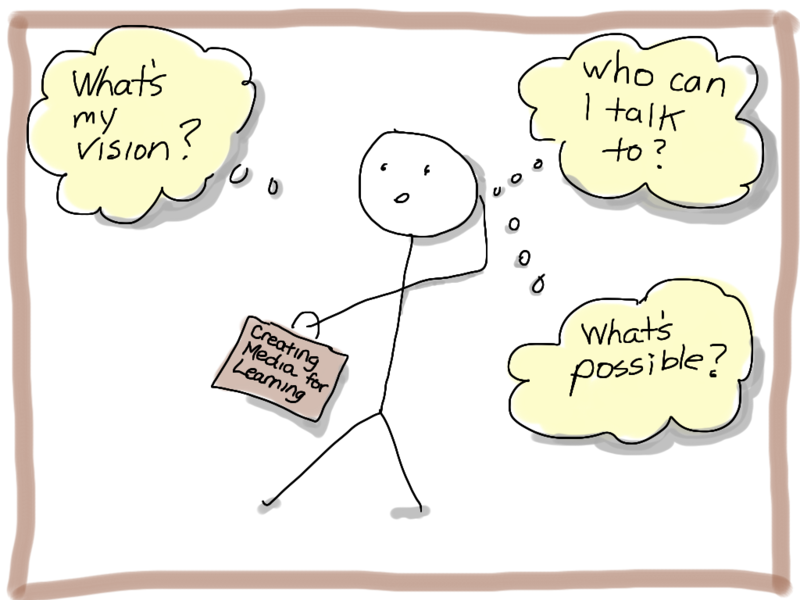 If you could influence one thing about how your students learn in your course – what would it be? What role might your project play? Why is it important/worth the time? Has someone else had the same vision? What did they do? Can you build on that? Thinking through these questions as a start can help you on your way to refining your idea and vision. The Plan It! section of the site can further refine your ideas. Learning/Instructional Designers: can help you design integrated and coherent learning pathways that connect your media project with the activities and outcomes associated with your course or learning environment. Media Specialists: can consult with you on the specifics involved in making media – from pre-production and planning through post-production and editing. Learning Technologists: can help you integrate your media project and learning activities into Connect or other web platform. Open learning practitioners: can advise on the hosting options and re-use strategies – considering your goals and interests. Peers: can help show you the ropes or advise on pitfalls to avoid. For information about where to find the people above, check the Support page. And to find out what your peers are doing, check Inspiration. Start with what you already know something about. You may have an interest in photography or videography – or perhaps you have been working with a new app on your tablet or computer. Do your current skills have any application for the project you are interested in? What are you interested in learning? What do you have the time and budget for? Beyond initial consultation, some professional services will cost you, so if you don’t have a budget, you may need to plan more time to learn what you need in order to do what you’d like to do. And, there is nothing wrong with starting small. If you are a PPT user and just want to learn to animate a presentation, add a voice over and put it online, that’s a good place to start.